Charles Marshall in front of T. rex at the Night at the Museum holiday party. 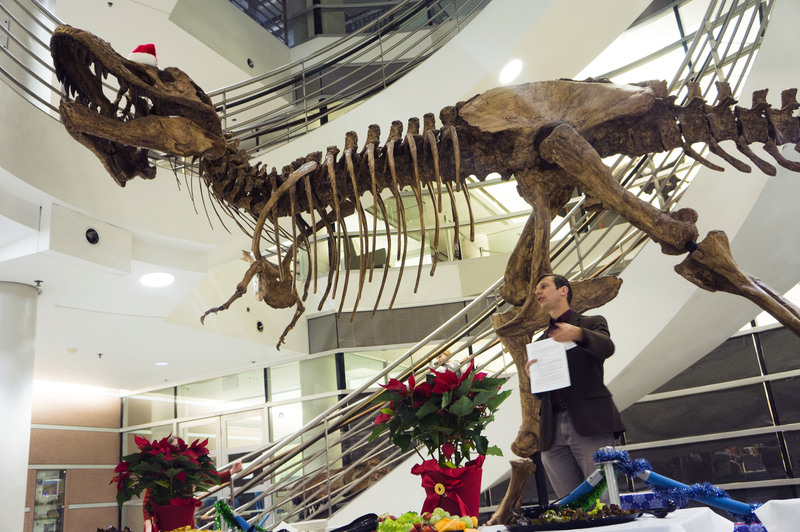 Wallace Atrium was buzzing with life as UCMP held it's "Night at the Museum" Holiday Party on December 3rd, 2015. More than sixty people attended the event to celebrate the holidays and recognize the generosity of UCMP supporters. Friends of the museum, UCMP staff, faculty, and students enjoyed great conversation, delicious food and specialty drinks fitting for the occasion: The Trilobite, Rise of the Angiosperms, and the Minty Mammoth Mojito. A highlight of the evening was the special behindthe- scenes tours of the collections showcasing the research projects being conducted at UCMP. Dori Lynn Contreras presented comparative morphology among tropical plant fossils. Ashley Poust & Mackenzie Kirchner- Smith described applications of 3D scanning technology on vertebrate fossil bones. Jeff Benca showed experimental work recreating the intense radiation scenario thought to affect early gymnosperms in the Permian. Mark Goodwin and Tony Huynh presented computer visualizations using data from CT scans of fossils. Sara El Shafie, Danielle Heinz and Elyanah Posner showed bird and other fossils from the McKittrick collection stored in the Campanile. Erica Clites, Holly Seyler, Patrick Garcialuna, Anne Zavala and Lillian Pearson highlighted invertebrate fossils found at Point Reyes, showed fossils that are part of the EPICC project, and discussed ongoing relationships between the UCMP and the National Parks.